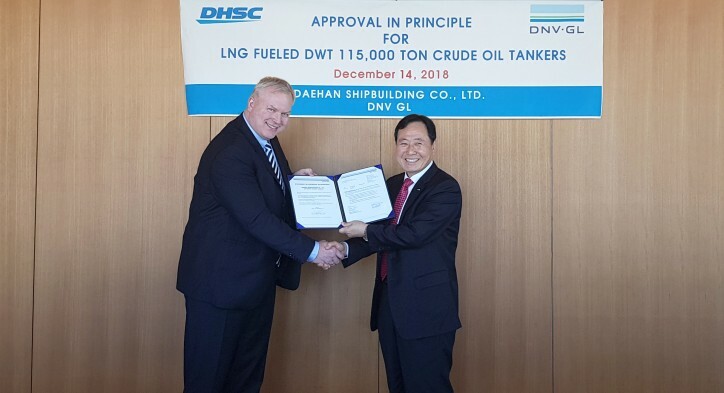 DNV GL has awarded Korean shipbuilder Daehan Shipbuilding Co., Ltd. (DHSC) an Approval in Principle (AiP) for the design of an LNG-fuelled 115,000 dwt Aframax tanker. As the maritime industry continues to build on its efforts to reduce emissions to air, LNG as a ship fuel is attracting a great deal of attention across many ship sizes and types. The new joint development project (JDP) undertaken by DHSC and DNV GL focussed on producing a design that is tailored to these emerging regulatory and market trends. Caption: Vidar Dolonen, Regional Manager of Korea & Japan at DNV GL – Maritime (left), presents the AiP certificate to Yong-Duk Park, CEO & President of DHSC. “We believe the completion of this joint development project will allow us to take a competitive position in a challenging market. Eco-friendly designs enabled DHCS to win newbuilding orders. The result of the JDP will be another enabler for us to strengthen our marketing strategy,” said Yong-Duk Park. As a market leader in the global Aframax sector, Daehan now has an approved design and source technology that can satisfy the sulphur cap regulations which will take effect on 1 January 2020. “We appreciate DNV GL’s efforts to ensure a successful JDP. Widening and deepening the technical expertise is essential to achieve DHSC’s vision to be the best medium-sized shipyard in Korea. DNV GL is the right partner to accomplish this,” said Mr Park.